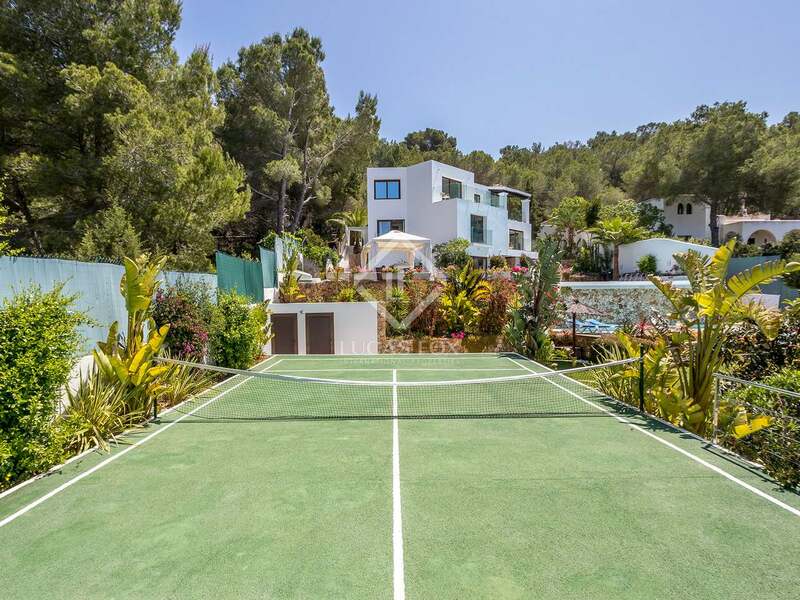 This stunning villa is ideally located on the west coast of Ibiza, in the natural scented pine hills and within walking distance of Cala Salada, one of the most beautiful beaches on the island. 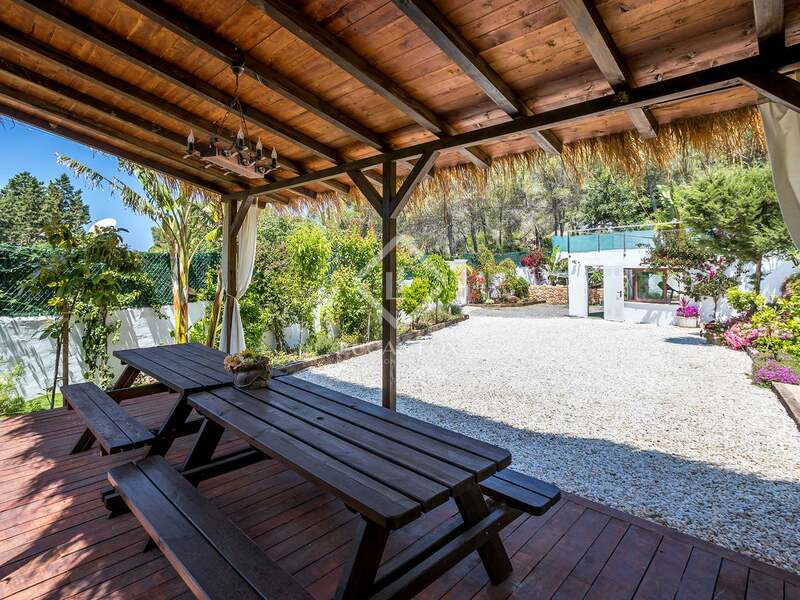 The charming town of San Antonio is a mere 3 km away and provides a range of amenities and services. 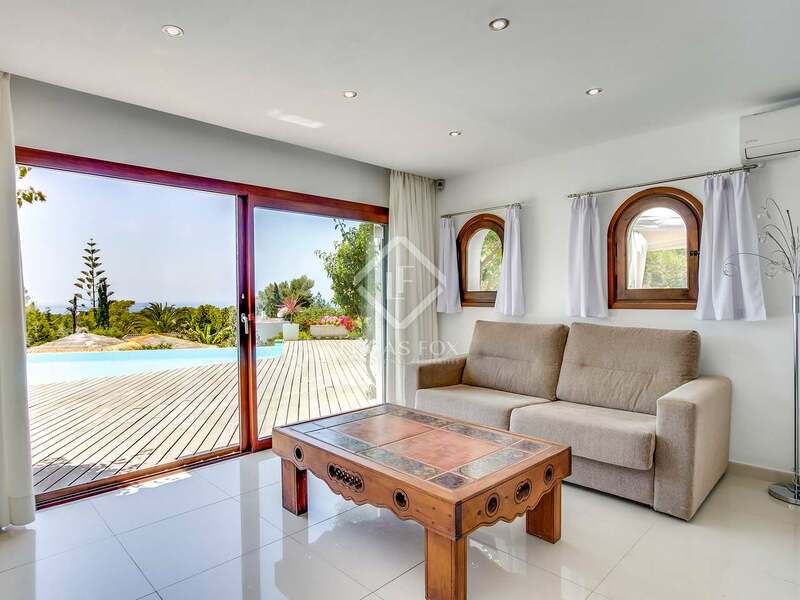 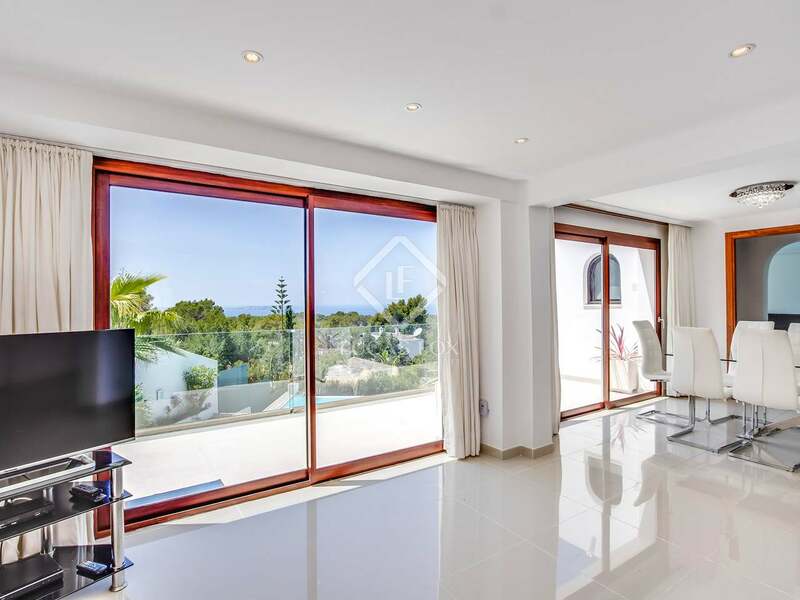 The villa has an authentic Ibiza feel and provides every modern comfort such as air conditioning throughout, marble flooring with underfloor heating, double glazing and high quality finishes. 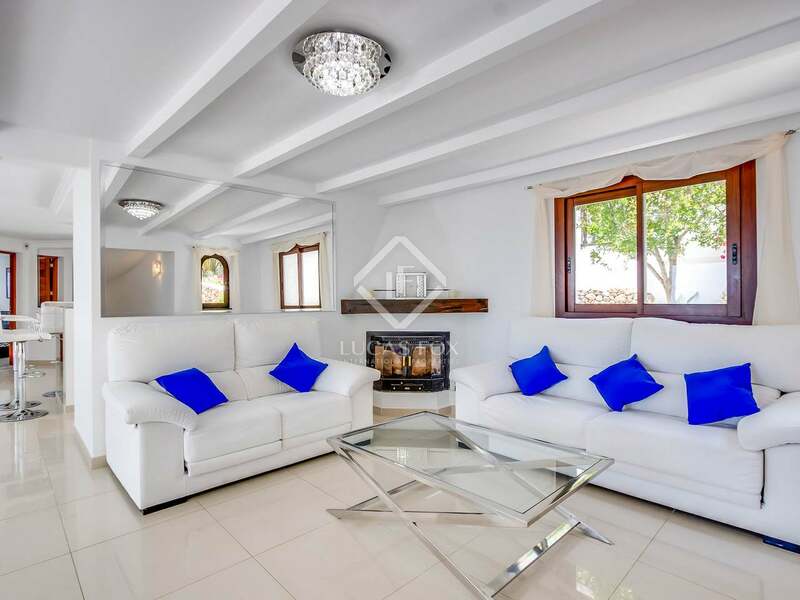 In the winter, the spacious living and dining area on the ground floor with its fireplace makes a wonderfully cosy place to retreat to. 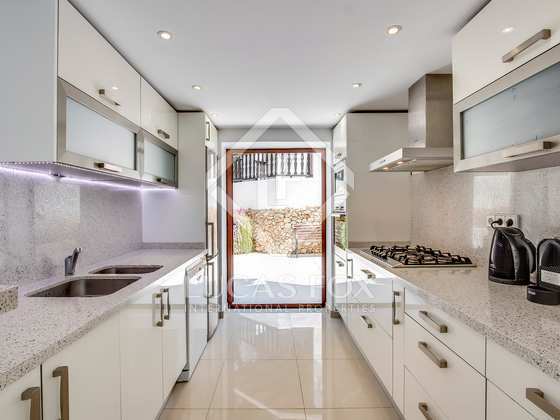 Also on this level of the house is the fully equipped, high spec kitchen with its Bosch 5-ring gas hob, fridge/freezer, dishwasher and microwave. 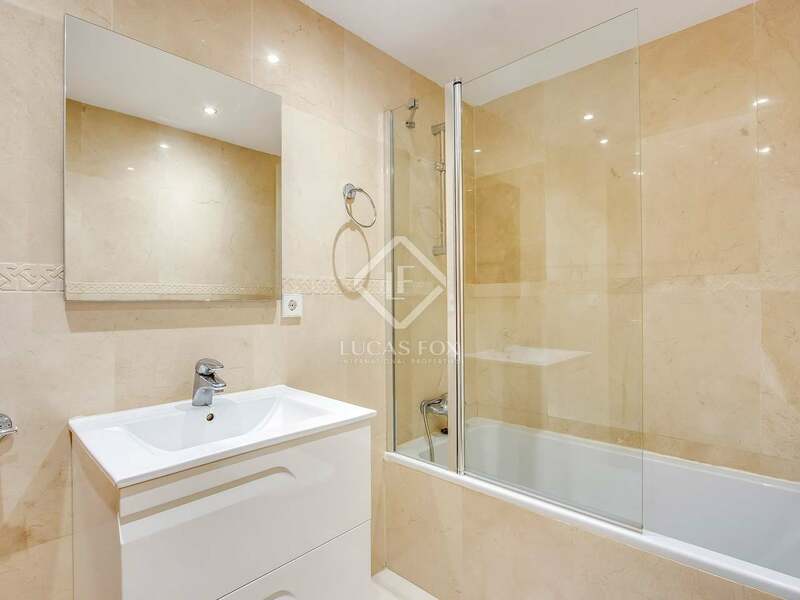 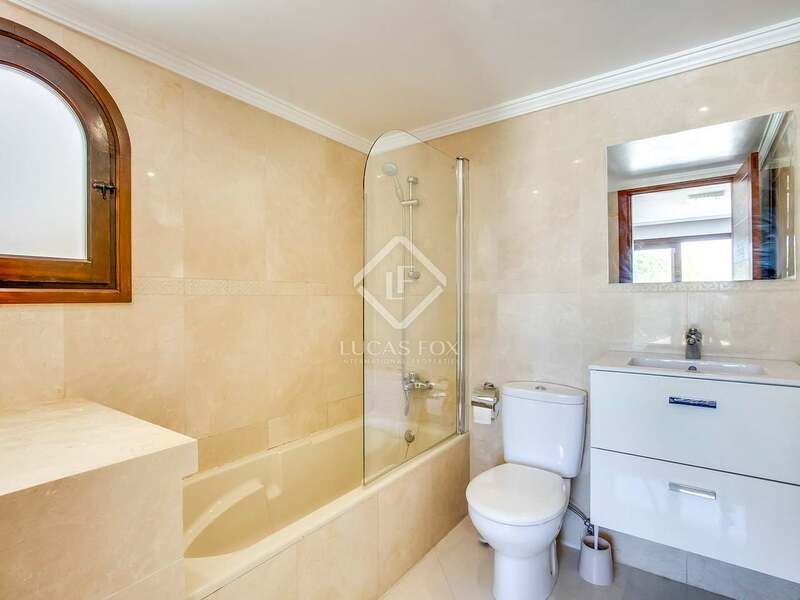 Two ensuite double bedrooms with sea views from the beds and a further guest toilet complete this level of the home. 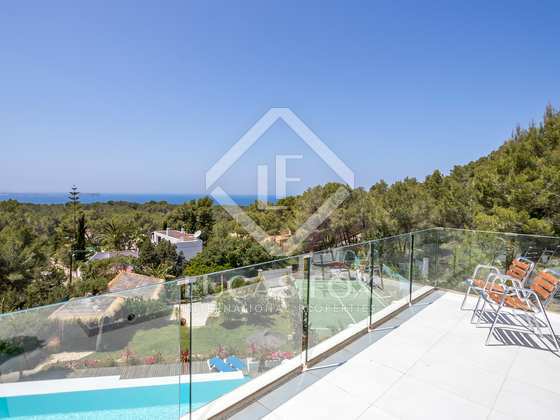 We reach the first floor via a spectacular wrought iron spiral staircase and find 3 further double bedrooms, 2 of which are ensuite, with fitted wardrobes and views of the sea and sunset from their balconies. 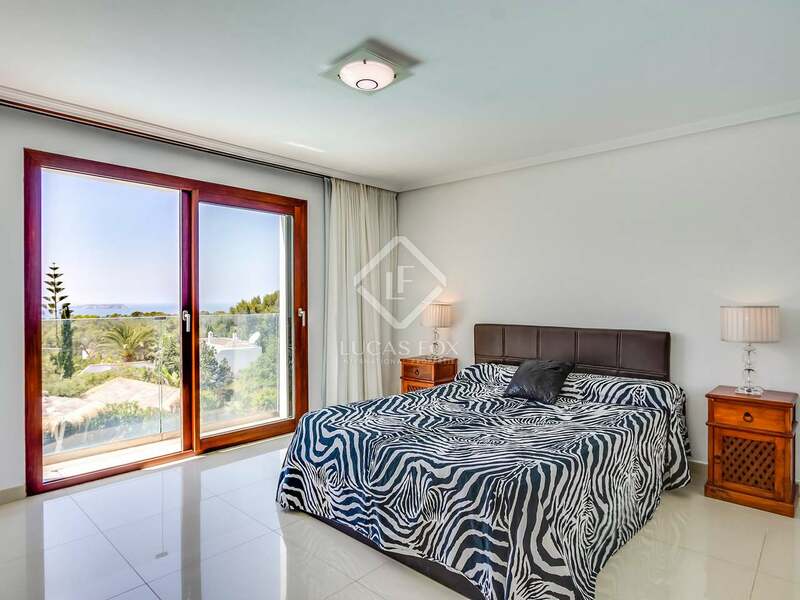 The main bedroom boasts a particularly spacious ensuite bathroom with a jacuzzi and divine sea views. 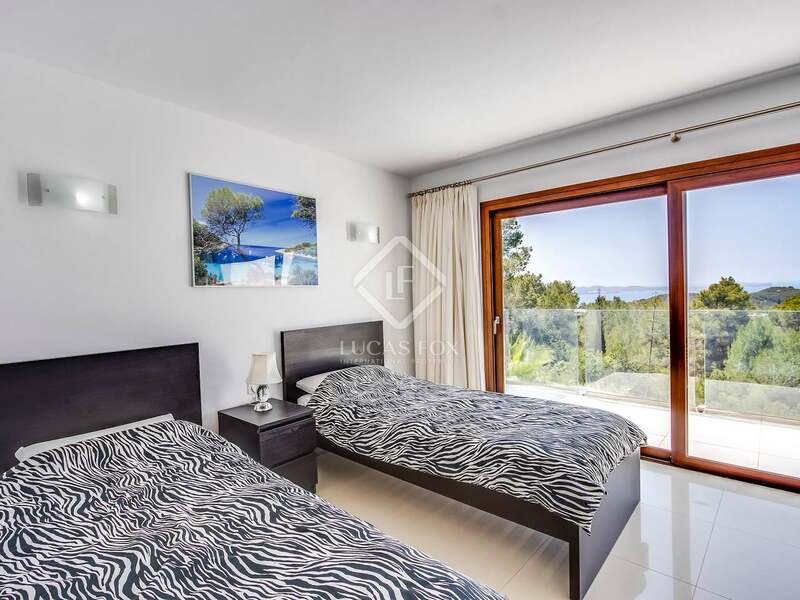 A separate studio apartment on the garden level, which is ideal for staff, guests or an independent family member, provides a bedroom, bathroom and a complete kitchen. 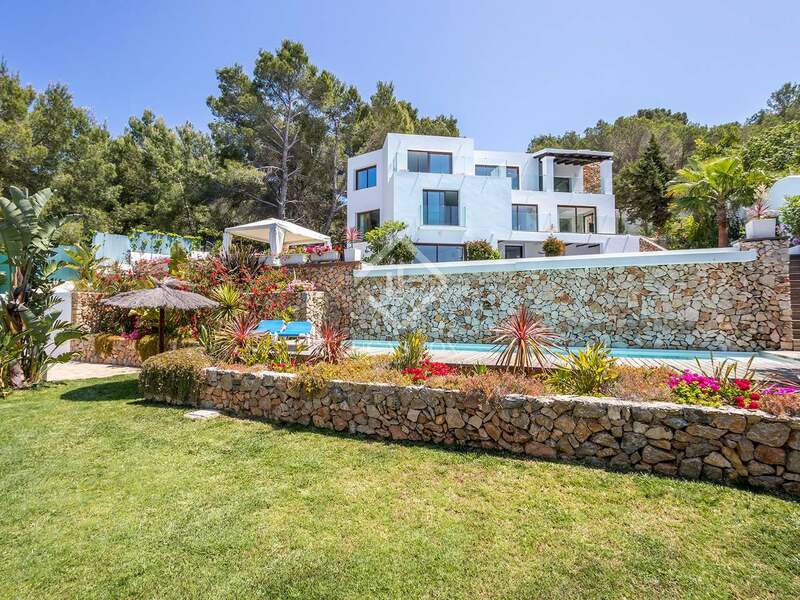 The property's exterior space offers outdoor living at its best, with various terraces and areas for relaxation and enjoyment. 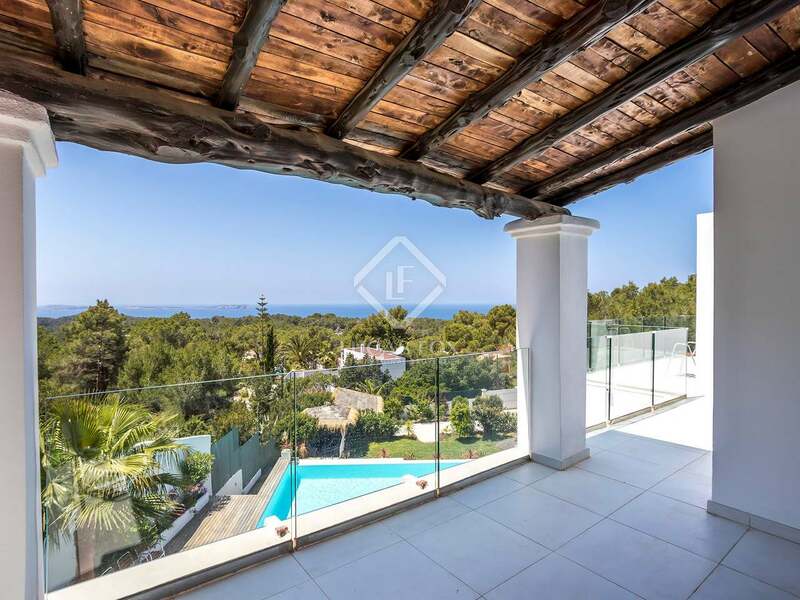 On an impressive wooden deck, with gorgeous sea and island views, we find an incredible infinity pool which cascades down into a separate children's pool; both of which are floodlit with relaxing colour therapy lights. 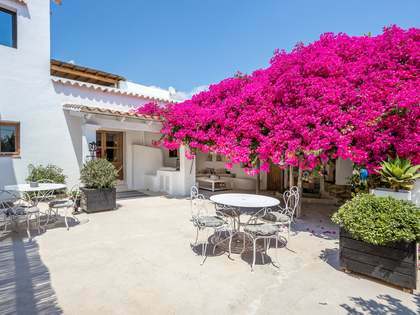 An outdoor bar and a charcoal and gas barbecue with a large pergola for dining in the shade, set the scene for many wonderful summer meals in Ibiza with family and friends. 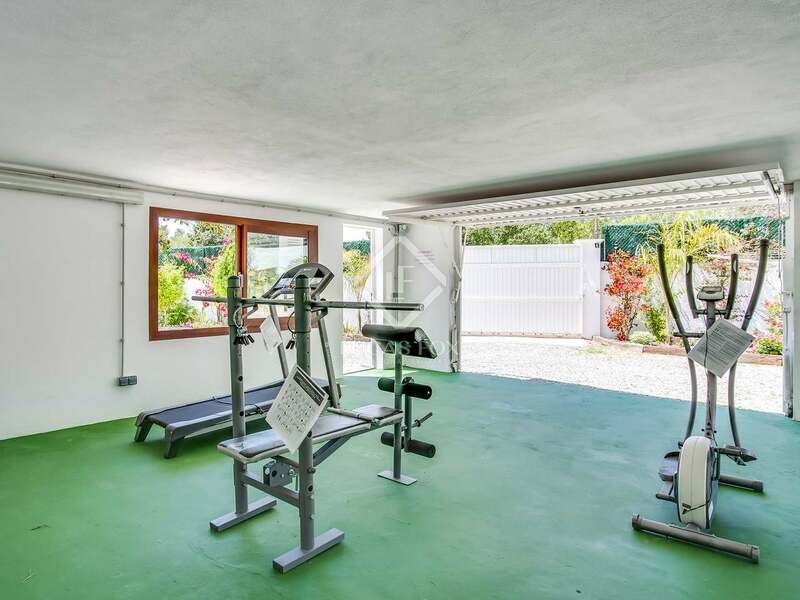 Next to this is the hot tub, a fully equipped gym, tennis court, basketball and table tennis area, outdoor bathroom, a fishpond and a storage room. 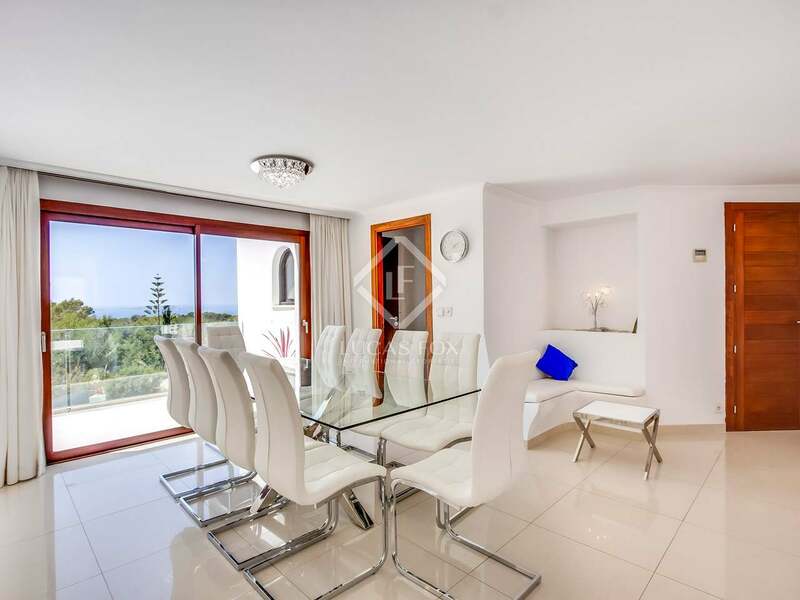 180-degree sea views and sunshine all day long can be enjoyed thanks to the west to south-west orientation of the property and the plot is monitored with a security camera and alarm system 24 hours a day for the owner's complete peace of mind. 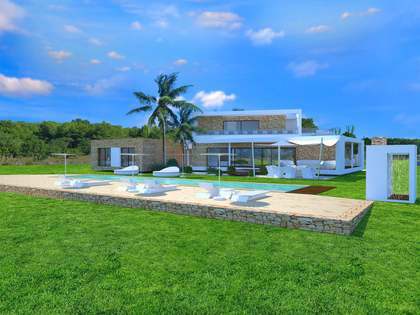 A magnificent villa in a wonderful location on the White Island. 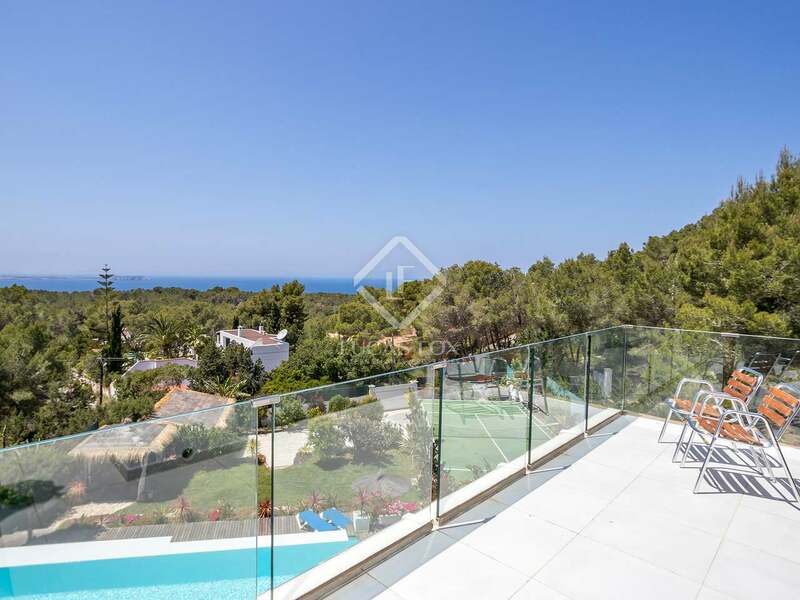 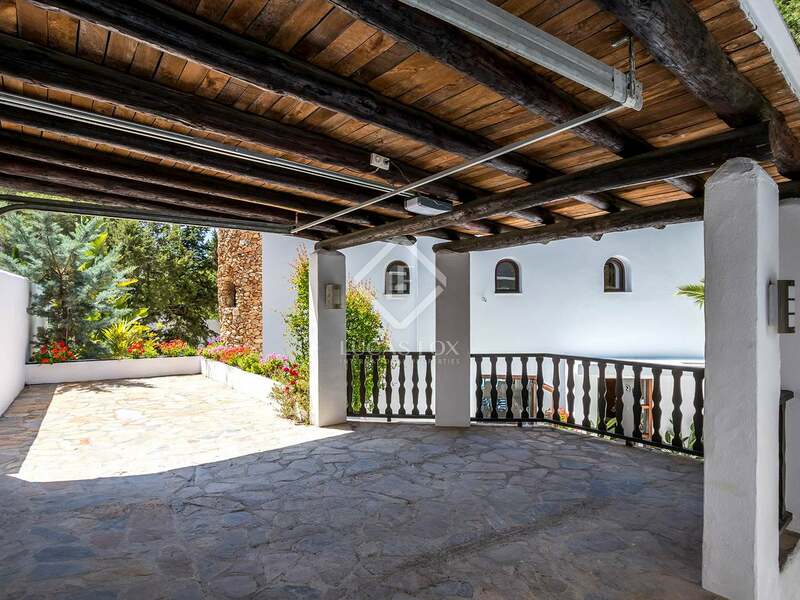 This spectacular villa is located on the west coast of Ibiza, in the protected pine forest, walking distance to Cala Salada, Europe's second best natural beach and well known for being one the most unspoiled parts of the island. 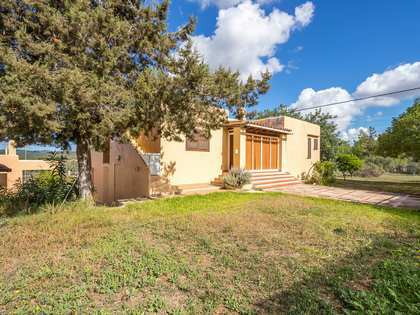 Just 3 km from San Antonio and all the amenities the busy town has to offer, the location provides a sense of seclusion and convenience at the same time.